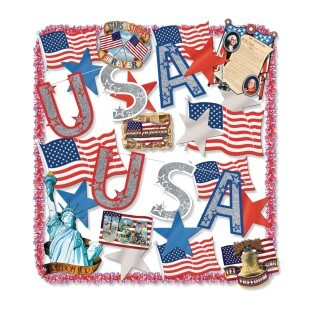 Cutouts, foil stars, banners and more! So many colorful salutes to the USA. Celebrate safely with this 25-piece flame-resistant patriotic trimorama kit that includes one 33" Miss Liberty cutout, one 23" Constitution cutout, nine 15" foil stars, two 25" American Flag cutouts, four 18" American Flag cutouts, four 16" American Pride cutouts, two 4-1/2" x 15" flameproof USA banners, two 25' fire-resistant tissue festooning.